Jade Roper isn’t just the girl who “stole” “my” princess date, she also is one of the most naturally beautiful girls I’ve ever seen in my life. It’s only natural that her makeup line would be called Naturally Jade. Jade is pure sugar. She’s just as pretty on the inside as she is on the outside. She’s a delicate, soft-spoken sweetheart. She was one of the greatest people in The Bachelor house to just curl up on the couch and drink coffee with. Jade carries herself like a real lady. Whether I was quoting Titanic word for word or regaling the group with one of my boyband adventures, I could always count on her to listen to me and just laugh at my ridiculousness without judgement. Even though she’s my friend, I wouldn’t be reviewing her product if I didn’t believe it to be great. Right now, Naturally Jade specializes in lip glosses. There are three shades: Sunrise, Cherry Red, and Pink Wisteria. All glosses are organic and chemical free. You know those rumors that claim women eat 7 pounds of lipstick in their lifetime? 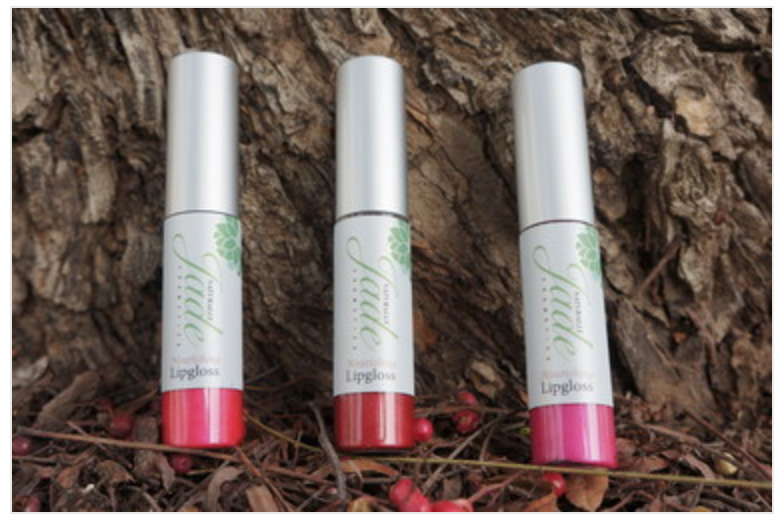 You can lick your lips with Naturally Jade glosses and feel guilt free. What’s even better? A dollar from every product purchased goes to women with cancer. I’m wearing Cherry Red on the top left & bottom right. I’m wearing Sunrise on top right and bottom left. Look at that amazing shine! This gloss has high pigment and it doesn’t fade. No, seriously. Naturally Jade color stays on your lips for hours. I also love that it’s not a sticky, gloopy gloss, but it has a beautiful shine. Its high quality ingredients make your lips feel moisturized and nourished. Think of Naturally Jade products as a better version of Chapstick with beautiful, long lasting color. Each gloss is $18 and can be ordered HERE! Ashley… what kind of boyband adventures? I am incredibly curious.